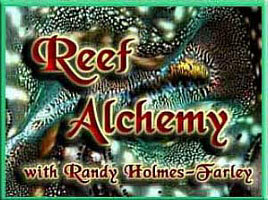 Reef aquarists fear a number of toxic chemicals in their aquaria. Many of these, such as copper and detergents, can be avoided by controlling what is added to the aquarium. Some, however, can be generated inside the aquarium, and consequently must be controlled in other ways. One of these is hydrogen sulfide. It can be produced in an aquarium's anoxic regions, such as inside or under live rock, inside sand beds and in denitrators. At sufficiently high concentration it is not only foul smelling, but can be lethal to many marine organisms. Being aware of when and how hydrogen sulfide can form may help aquarists avoid elevated concentrations in their aquaria, and allow them to understand how to deal with it if such events occur. This article describes in detail what hydrogen sulfide is, how it is toxic, how it forms and degrades, and suggests ways to avoid toxicity problems. Sulfur can take many forms in the marine environment. Figure 1 shows a greatly abbreviated sulfur cycle that pertains especially to processes that take place in reef aquaria. Subsequent sections of this article will expand on several of these processes, but it is worthwhile to have the whole cycle in place as a framework before such discussions. The tour starts with sulfate (Figure 1, middle top; SO4--). Sulfate consists of one sulfur atom surrounded by four oxygen atoms, and it carries a charge of -2. It is the most oxidized form of sulfur in seawater and is also one of the most abundant ions, having a natural seawater concentration of about 2700 ppm. Various processes in reef aquaria can raise or lower the sulfate concentration considerably. Adding Epsom salts (magnesium sulfate heptaydrate) to boost magnesium, for example, raises sulfate more than it does magnesium. Likewise, adding calcium chloride to boost calcium reduces sulfate if salinity is maintained. Nevertheless, so much sulfate is present in seawater that such changes occur slowly over time. Figure 1. Simplified sulfur cycle in reef aquaria. 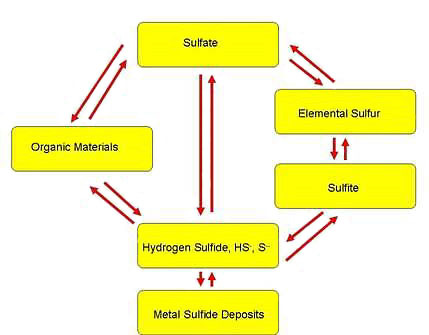 Under anoxic conditions (ORP less than about 0 mV) some bacteria can use sulfate to metabolize organic material, producing hydrogen sulfide (H2S) as a byproduct (Figure 1, middle bottom). Hydrogen sulfide is the most reduced form of sulfur present in seawater, and areas of negative redox values are known as reducing zones. In reef aquaria the reduction of sulfate can occur in many places, such as under sand or inside live rock. It also can take place in denitrators if their flow is low enough that the nitrate is depleted while organic material is still available for decomposition. Hydrogen sulfide produced in anoxic regions can produce several possible outcomes. One is to diffuse into more oxic (aerobic) regions, even into the water column itself, where it can be toxic to organisms. In the water column it can be oxidized to sulfate or other sulfur species (elemental sulfur (S), sulfite (SO3-) and others; Figure 1, right). Such oxidation reactions are catalyzed both by soluble metals such as iron and by light. Hydrogen sulfide also can combine with metals such as iron (Fe++) to precipitate as black iron sulfide (Figure 1 bottom; FeS and FeS2). This blackness is the telltale sign of hydrogen sulfide formation that can be seen in anoxic seawater sediments, although similar appearing black precipitates may be formed from other materials. Both hydrogen sulfide and sulfate can become sources of sulfur for the biosynthesis of organic compounds (Figure 1, left) by organisms ranging from bacteria to fish. Most proteins contain sulfur, for example, since some amino acids from which they are made contain sulfur. When organic materials that contain sulfur are metabolized, both hydrogen sulfide and sulfate can result, depending on the circumstances of that metabolism. Organic materials added to an aquarium as foods are also sources of such organic sulfur compounds. Reef aquarists using sulfur denitrators are adding elemental sulfur (S) that is not normally present in large concentrations in oxic ocean waters. This sulfur can become oxidized by oxygen (O2), nitrate (NO3-) and other oxidizing species to become sulfate. Hydrogen sulfide is commonly known by many other names, including hydrosulfuric acid, hydrogen sulphide, sewer gas, stink damp, sulfur hydride, sulfurated hydrogen, dihydrogen monosulfide and dihydrogen sulfide. Hydrogen sulfide, H2S, is analogous to the water molecule, H2O, with the sulfur atom taking the place of the oxygen atom (Figure 2). Unlike water, hydrogen sulfide is a gas at room temperature. It can be condensed into a liquid at temperatures below -60°C, and into a solid below -85°C. The reason that it is not a liquid at room temperature like water is that the sulfur atom is much poorer at hydrogen bonding, and it is the hydrogen bonds in water that hold it in liquid form. For those chemists who use hydrogen sulfide in the laboratory, it can be purchased as a compressed gas in cylinders. Many of its physical properties can be found in this linked article. 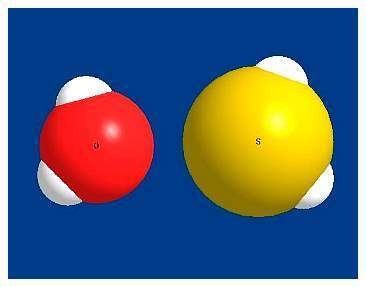 water (H2O; left) to the larger hydrogen sulfide (H2S; right) molecule. Hydrogen sulfide has many natural and man-made sources. Volcanoes, undersea vents, swamps and other stagnant bodies of water and sulfur springs are common sources. It is also a common cause of bad breath, as it can be produced by bacteria in the human mouth at concentrations ranging up to 100 ppb. It can also comprise up to 10% of intestinal gases, and flatus can contain up to at least 18,000 ppb hydrogen sulfide. The concentration of hydrogen sulfide in typical ambient air over land is on the order of 0.1 to 0.3 ppb. In anoxic basins in the ocean, such as the Cariaco Trench or the Black Sea, hydrogen sulfide typically ranges from 0 to 200,000 ppb and is often in the 500 to 10,000 ppb range. Hydrogen sulfide is much more prone than water to this ionization, because the larger sulfur ion can spread out the charge to a greater extent and hence is more stable than an oxygen ion. Pure water with a pH of 7 contains equal amounts of H2S and HS- (hydrosulfide ion), while in order for H2O to have equal concentrations of H2O and OH-, the pH needs to be above 14. At pH values above 7, HS- dominates. At very high pH (above 11), the HS- may ionize again to form a sulfide ion (S--). This ionization is actually somewhat controversial. Literary sources give values for its pKa between 12 and 14, but more recent data suggests that it doesn't ionize until the effective pH is higher than 14 with lower values previously reported being erroneous due to oxidation during the experiment. Figure 3. 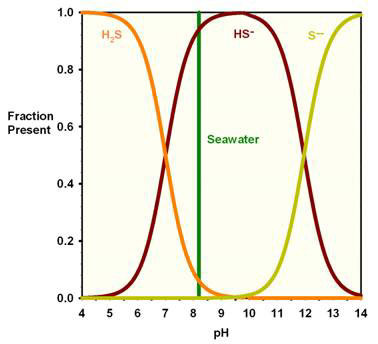 Speciation of hydrogen sulfide as a function of pH in freshwater. The distribution of the different forms of hydrogen sulfide is shown in Figure 3 (above) as a function of pH in freshwater (assuming the second pKa is about 12). Table 1 shows the relative ratio at pH 8.2 in freshwater. I could not find exact values for seawater, but ions usually form slightly more easily in seawater, so its proportion of H2S at any given pH is likely lower. These forms are in rapid equilibrium, so any given S atom will convert between all of these forms many, many times each second. Clearly it is the HS- form that predominates in reef aquaria, but the other forms are very important. Only the H2S form volatilizes and is detected as a foul odor. It is also likely the neutral H2S form crosses cell membranes and enters organisms to cause potential toxicity (as is the case for ammonia, with NH3 v. NH4+, where it is the neutral NH3 form that crosses membranes and causes toxicity). On the other hand, even though the S-- form is only a small fraction of the total, it is also very important as it is this form that precipitates with metals to form the black deposits characteristic of hydrogen sulfide formation in sediments. Even though it is only a small fraction of the total at any given instant, all of the sulfide can be removed from seawater by precipitation as metal sulfides if sufficient metals are available. An analogy is that only a small fraction of the water in a reef tank is inside a pump at any given instant, but over time, all of the water can pass through it and be sent to a different part of the system. I have used this process to my advantage in some lab experiments I did years ago. After passing hydrogen sulfide gas from a cylinder through a chemical reaction, I sent the excess bubbles into a very high pH solution (> pH 14), trapping the sulfide in the water as S--. This solution could be disposed of by a waste disposal company much more easily than if I had somehow tried to collect the gas itself. 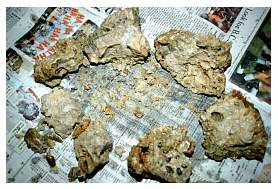 Hydrogen sulfide has a strong "rotten egg" smell. The odor of H2S can be detected in the air by humans at levels as low as 0.5 to 300 ppb. The large variation in range indicates that some individuals are very much more sensitive to it than others. Interestingly, humans may become insensitive to the odor at concentrations above 100,000 ppb. For this reason, individuals working with the gas need to be aware that they may no longer smell hydrogen sulfide when it is present at life threatening concentrations. When I have used hydrogen sulfide in the laboratory, I have worn sensor badges that indicate exposure to concentrations that may be too high to smell, warning that action needs to be taken immediately (fortunately, I was very careful to work in a chemical fume hood and never smelled, nor was I exposed to any hydrogen sulfide). When dissolved in water, the smell depends strongly on pH (which determines how much is in the volatile, hence "smellable," H2S form). Humans often can just detect hydrogen sulfide odors when the concentration is above about 0.029 ppb in freshwater. In seawater at pH 8.2, where only 6% of the sulfide present is in H2S, this odor threshold is likely higher, perhaps on the order of 20-fold higher (0.6 ppb). Fortunately, that threshold is below the lethal limit of many aquatic organisms (usually above 5 ppb; sometimes as high as 50,000 ppb), so odor often can be detected by humans before hydrogen sulfide rises to acute, lethal concentrations in reef aquaria. Under conditions typically found in seawater, hydrogen sulfide reacts with oxygen to form a variety of oxidized sulfur species (sulfate, SO4--; sulfite, SO3-- and thiosulfate, -SSO3-, which looks like sulfate except that one oxygen atom is replaced by an additional sulfur atom).1 The percentage of each of these species that is formed depends on the salinity, the pH and the temperature, but the predominant product is typically sulfate. The rate of the oxidation of sulfide in this fashion depends linearly on the concentration of both sulfide and oxygen, and can be catalyzed by certain metals, such as iron.1 Typically the half life of hydrogen sulfide under such conditions is less than a day, and can be only a couple of hours. In a reef aquarium where iron is dosed, the half life may be much lower as the added iron may accelerate the oxidation to even higher rates, potentially protecting organisms. Since many reef aquarists have sufficient amounts of iron oxide/hydroxides in their systems to bind iron, this may be an important mechanism for hydrogen sulfide detoxification in some reef aquaria. Sulfide in seawater is also unstable toward precipitation with certain metals. The black deposits often seen in anoxic sediments are typically metal sulfides, especially ferrous sulfide (FeS) and pyrite (FeS2), with much smaller amounts of copper, manganese, zinc, nickel and cobalt sulfides. The exact processes whereby these metal sulfides form in marine sediments and elsewhere is complicated and still under study.6 In some areas, like the Orca basin in the Gulf of Mexico, deposited iron sulfides make up as much as 0.7% of the sediments' mass.7 So, iron sulfides are not necessarily a trace component. Hydrogen sulfide can also be taken up by bacteria, and oxidized under aerobic conditions back to sulfate. In this process the bacteria gain energy, much as other organisms gain energy by oxidizing organic (carbon) compounds. Bacteria can also use manganese oxide instead of O2 to produce sulfate from hydrogen sulfide, so the process can occur even in anoxic conditions. The process does not occur in a single chemical step, but usually involves such intermediates as thiosulfate (-SSO3-). The reason that oxygen is called an electron acceptor is that in the reaction above, electrons are transferred from the carbon and hydrogen atoms to the oxygen atoms. Note that the ammonia produced is not oxidized to nitrate under these conditions as it is under aerobic conditions. Each of these processes produces different amounts of energy for the organisms involved. Oxidation with O2 produces the most energy, followed by nitrate, then manganese, iron, sulfate and finally carbon dioxide with methane as the product. Organisms (or more correctly, ecosystems that evolve containing many different organisms) often get as much energy as they can from a food supply, so until the O2 runs out, few organisms carry out anything other than oxidation processes. The other processes are each carried out in turn, either chronologically in certain situations, or with depth into a substrate. Sulfate is one of the last usable electron acceptors available in seawater. However, it is also available in far higher concentration (2700 ppm) than any of the other acceptors (which are often sub ppm), so it can sometimes be used in parallel with all the other electron acceptors besides O2. These processes are typically carried out by bacteria and archaea under low oxygen conditions. They take up sulfate via transporters in their cell membranes, and then use it internally in a series of separate chemical processes ending with it being transformed into hydrogen sulfide. In addition to these biological processes, purely chemical reactions also produce hydrogen sulfide in the ocean. The heat of hydrothermal vents, for example, can drive the reaction between organic materials and sulfate to produce hydrogen sulfide. While the process can theoretically proceed at as little as 25°C, it is so slow at that temperature as to be unimportant. At 200°C, typical reactions along these lines can take months to years, and it has not been demonstrated at less than 125°C. Such reactions should consequently have minimal importance in most reef aquaria. The study of the chemistry or the pore water in marine sediments is widespread, extensive and ongoing. It is beyond the scope of this article to cover this topic, but a few comments about hydrogen sulfide in this environment are warranted as sediments are the most likely place for hydrogen sulfide to be produced in a reef aquarium. Because of the processes described above, marine sediments often accumulate hydrogen sulfide and deplete in sulfate. This zone often starts a few centimeters below the surface, and can extend up to a meter or more before the sulfate is fully depleted. Below that depth, other processes take place, such as methane production. These additional processes are also beyond the scope of this article. In general, as seawater becomes depleted of oxygen, a series of chemical transformations takes place, largely due to biological activity continuing to consume oxygen and other electron acceptors. There is a specific order of usage of electron acceptors that can result in a layering of chemical processes with depth, either into sediments, or sometimes into anoxic waters in enclosed basins. As mentioned above, this order of electron acceptors used to oxidize organic material is oxygen (O2), then nitrate (NO3-), then manganese (Mn++++), then iron (Fe++), then sulfate (SO4--). Researchers can plot the concentrations of these chemicals as a function of depth, and can also associate an ORP with each transition, although some overlap of the chemistries takes place in each zone. The oxygen zone has an ORP of 0 to 600 mV, the nitrate zone is -150 to 550 mV, the manganese zone is -50 to 400 mV, the iron zone is -700 to -150 mV and the sulfate reduction zone is -850 to 0 mV. Consequently, if hydrogen sulfide is being formed from sulfate, the ORP is likely below 0 mv in that region. Tables 2 and 3 summarize some data in the scientific literature for the lethality of hydrogen sulfide and also for sodium sulfide (which dissolves to form a sodium ion and a sulfide ion) to a variety of aquatic organisms. The data are given as the LC50, which is the concentration at which half of the organisms die when exposed over a period of an hour to a few days. Briefer exposures are typically less likely to cause death than are longer exposures to the same concentration. For example, the LC50 for Gammarus pseudolimnaeus after 96 hours of exposure was 22 ppb, but in a longer test of 105 days, the concentration needed to be below 2 ppb to ensure survival.14 Clearly, the lethal concentrations vary tremendously from organism to organism, ranging from 7 ppb for Brown Trout to 750,000 ppb for the Western Mosquitofish. Table 2. Toxicity of hydrogen sulfide to various aquatic organisms. Table 3. Toxicity of sodium sulfide (Na2S) to various aquatic organisms. Many marine species live in close proximity to sediments that often contain hydrogen sulfide. Some even live in them. From the data in Tables 2 and 3, it is clear that the range of susceptibility to hydrogen sulfide poisoning is huge, and those species more prone to natural exposure often have higher tolerance. How do they accomplish that? Likely by more ways than are presently known, but even so, some of these organisms' mechanisms are known. In the marine worm Urechis caupo, for example, it has been shown that excess hydrogen sulfide is oxidized to thiosulfate (-SSO3-).19 The thiosulfate is then allowed to passively diffuse out of the organism's hindgut. Interestingly, this worm also appears to make hydrogen sulfide out of sulfur-containing amino acids and use it as a gasotransmitter, controlling its body wall's muscle tone.20 Whether this mechanism also helps it limit exposure to ambient hydrogen sulfide is unclear. The marine worm Halicryptus spinulosus has an even more elaborate system. During exposure to hydrogen sulfide under oxic conditions, it oxidizes the hydrogen sulfide to thiosulfate, just as the Urechis caupo does. Under anoxic conditions, it has a multi-pronged strategy. Its first defense is to supply iron for precipitation of iron sulfide on its surface and in its blood. Under these conditions, the animal's surface and its blood blacken considerably, but this process is reversible once oxic conditions return. Finally, these worms apparently bind sulfide to an unidentified chemical in the hemolymph, providing additional protection for its mitochondria. A number of aquarists have reported black metal sulfide deposits in their reef aquaria, especially in sand beds. I recently took down a reef aquarium that had been in operation for 10 years. It was doing just fine (Figure 4 below) and had never suffered any decline that some aquarists would call "old tank syndrome." I wanted to replace the stand, however, with a more attractive custom stand, and to do so required taking it all apart. So, I took the opportunity to replace the glass aquarium as well. Figure 4. My ten-year-old reef aquarium that I took down in October, 2005 to replace the stand. 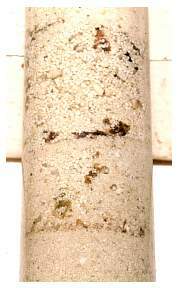 The aquarium had a bed of 1-2 inches of fine oolitic aragonite sand and contained wild Florida live rock (not aquacultured) placed in the tank when it was started. As I dug through the sand, I found no black areas, and detected no unpleasant odors. None of the rock had any apparent grey or black discoloration. All rocks were a uniform tan color on areas not exposed to light. The sand was put into a bucket and remained in the garage for two weeks. When I then dumped the sand out behind the garage, it was grey and it stank to high heaven. Clearly the processes leading to hydrogen sulfide formation were not taking place in the sand bed in the tank, but that same sand quickly became anoxic when removed from the aquarium. As an experiment, I also took some samples from one of my refugia. This refugium had about six inches of fine oolitic aragonite sand on its bottom, and has live rock and macroalgae above that. It has been in place for several years. I took samples by pressing glass test tubes into the sand, removing cores of sand that were 1-4 inches long. None showed any signs of discoloration or odor. I then set one of these cores aside. To a second core sample I added some flake food on the top of the core while still in the tube, then added another core on top of it in the same test tube. This tube was also set aside. After two weeks I examined them. I expected more discoloration in the tube containing the flake food, as it provides a lot of organic material to decompose, but that really didn't seem to be the case, at least over the two weeks involved. There was discoloration around some of the flakes, but mostly the flakes seem unchanged with just a few of them being discolored and with other scattered black spots throughout the sample (Figure 5). Even the unaltered core smelled bad and had black discoloration in distinct areas (Figure 6). Apparently, plenty of organic material is already in these sands to drive anoxia IF they are removed from the system so that oxygen cannot get to them. Figures 5 & 6. 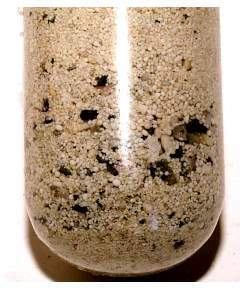 Sand that had been in my aquarium for many years, collected by coring a deep sand bed. Flake food was added on top of the sand sample after coring, and then another inch of live sand was added on top of that. It was set aside for two weeks before the picture was taken. 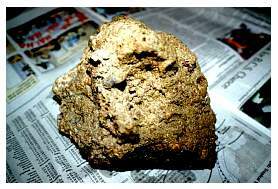 I had also heard that live rock sometimes can be shown to have internal sulfide deposits. To test this idea, I decided to break open some of the live rock that had been in the tank. Figure 7 shows a typical rock that I examined. As mentioned above, it was wild rock collected from Florida about 10 years ago. It was a uniform tan color on the outside, and had not been buried under the sand. 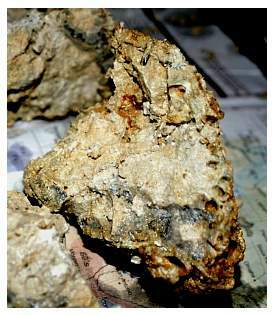 Upon breaking it open with a hammer (Figure 8), it is clear that there are some grayish sulfide deposits in it (Figure 9), but they do not occupy the rock's entire interior. These deposits did not smell, but are probably metal sulfides nevertheless. Figures 7 & 8. Left: A live rock collected wild in Florida more than ten years ago that had been in my aquarium since collection. Right: The same rock as in Figure 7, now broken open. Figure 8. The dark band suggests metal sulfide deposits. Other aquarists have not been as fortunate as I have with respect to hydrogen sulfide formation, especially in their sand beds. Some aquarists have found anoxic regions in deep sand beds that reek when disturbed. Sometimes aquarists have run into problems when trying to remove a sand bed containing hydrogen sulfide. In some cases, corals and other organisms have died as a result. Whether these resulting deaths were from hydrogen sulfide or other causes is impossible to say, but it is a reasonable hypothesis, and one that can provide some potential preventive measures that will be discussed below. It is not, however, always trivial to distinguish black sulfide deposits from very dark forms of algae or cyanobacteria, or simply old organic debris. In totally dark regions (such as several inches below a sand bed), black deposits are very likely due to metal sulfide formation. But closer to the surface, such as along the glass under the sand's surface, it often can be difficult to identify by looking at a picture alone. In soliciting pictures for this article, a great many of those submitted looked more like algae to me than metal sulfides. 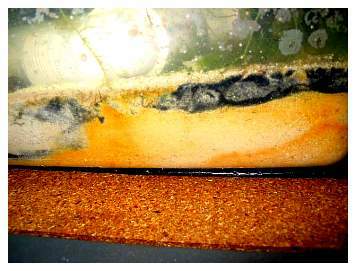 Figure 10 shows a black patch in a marine aquarium that may likely be sulfide deposits. that may be metal sulfide. Aquarists sometimes have to deal with situations where hydrogen sulfide exposure is a possibility. The suggestions below may be useful in preventing or correcting such problems. 1. Avoid burying organic materials under sand or rocks. This organic material decays, and that decay can drive the formation of hydrogen sulfide. Burying live rock under sand, for example, will likely kill many organisms and when they decay, H2S may be formed. 2. When using a denitrator, be careful not to set its flow too slow so that nitrate is eliminated and sulfate reduction takes over. The ORP in the denitrator may or may not be a useful guide here, depending on the setup. 3. Do not store live sand for extended periods without placing it in circulating aerated water. 4. Do not add organisms (such as certain fish) that dig up sand beds if there is significant potential for hydrogen sulfide release. 5. Be careful that equipment failures (such as a powerhead falling off the side of an aquarium onto the sand) will not disturb sand beds if sulfide deposits are suspected. 6. Do not stop the flow of aquarium water inside piping or other closed systems for more than an hour or two. If it is necessary to stop the flow for a longer time, collect the water rather than sending it back into the tank. 7. Do not store tank water or natural seawater without stirring and aeration for more than a few hours. Raw artificial seawater made with pure fresh water does not have this concern, as there are no organics in it to decay. It can be stored unstirred for as long as desired. A. Remove delicate organisms from the tank system, if possible. B. Perform the change when the lights are as bright as possible, preferably near the end of the light cycle. The lights drive the O2 concentration higher, speeding the oxidative removal of hydrogen sulfide, and the light itself will catalyze the oxidation of H2S. C. Maximize aeration. A high oxygen level drives hydrogen sulfide oxidation, and high aeration will drive some off as volatile H2S gas. D. Add an iron supplement to help catalyze oxidation of hydrogen sulfide and the precipitation of ferrous and/or ferric sulfide. Use one chelated to an organic; either ferrous or ferric iron will work. E. Pass the water over iron oxide/hydroxide (GFO) to convert hydrogen sulfide to elemental sulfur. F. Pass the water over activated carbon, which may bind some sulfide, and may also catalyze the oxidation. If forced to choose between carbon and GFO, I'd pick the GFO media. Hydrogen sulfide is something that most reef aquarists eventually encounter. Some unfortunate aquarists encounter it on the first day of their exposure to reef aquaria when their live rock arrives and dead organisms are decaying. From that day on, aquarists should be aware of the risk of generating hydrogen sulfide, especially in sand beds. Special thanks to Jens Kallmeyer for supplying a copy of his doctoral thesis "Sulfate Reduction in the Deep Biosphere," which provided an extensive background on a variety of the processes described in this article. 1. The products from the oxidation of hydrogen sulfide in seawater. Zhang, Jia Zhong; Millero, Frank J. Rosenstiel Sch. Mari. Atmos. Sci., Univ. Miami, Miami, FL, USA. Geochimica et Cosmochimica Acta (1993), 57(8), 1705-18. 2. Photoinduced oxidation of H2S species: a sink for sulfide in seawater. Pos, Willer H.; Milne, Peter J.; Riemer, Daniel D.; Zika, Rod G. Rosenstiel School of Marine and Atmospheric Sciences, University of Miami, Miami, AL, USA. Journal of Geophysical Research, [Atmospheres] (1997), 102(D11), 12831-12837. Publisher: American Geophysical Union. 3. Oxidation of hydrogen sulfide by Mn(IV) and Fe(III) (hydr)oxides in seawater. Yao, Wensheng; Millero, Frank H. Rosenstiel Sch. Marine Atmos. Sci., Univ. Miami, Miami, FL, USA. ACS Symposium Series (1995), 612(Geochemical Transformations of Sedimentary Sulfur), 260-79. Publisher: American Chemical Society. 4. Oxidation of hydrogen sulfide by hydrous Fe(III) oxides in seawater. Yao, Wensheng; Millero, Frank J. Rosenstiel Sch. Marine, Atmosphere Sci., Univ. Miami, Miami, FL, USA. Marine Chemistry (1996), 52(1), 1-16. Publisher: Elsevier. 5. The use of hydrous iron(III) oxides for the removal of hydrogen sulfide in aqueous systems. Poulton, Simon W.; Krom, Michael D.; Van Rijn, Jaap; Raiswell, Robert. University of Leeds, School of Earth Sciences, Leeds, UK. Water Research (2002), 36(4), 825-834. Publisher: Elsevier Science Ltd.
7. Variations of calcium carbonate, organic carbon and iron sulfides in anoxic sediment from the Orca Basin, Gulf of Mexico. Sheu, Der Duen; Presley, B. J. Dep. Oceanogr., Texas A and M Univ., College Station, TX, USA. Marine Geology (1986), 70(1-2), 103-18. 9. Chemical studies on sea water and bottom mud of fish farms. II. Seasonal variation. Aoki, Toshio; Okaichi, Tomotoshi; Ochi, Tadashi. Kagawa Univ., Kagawa, Japan. Kagawa Daigaku Nogakubu Gakujutsu Hokoku (1967), 18(2), 176-80. 10. Sulfur and iron cycling in a coastal sediment: radiotracer studies and seasonal dynamics. Moeslund, Lars; Thamdrup, Bo; Joergensen, Bo Barker. Institute of Biological Sciences, Aarhus University, Aarhus, Den. Biogeochemistry (1994), 27(2), 129-52. Publisher: Kluwer. 11. Physiological roles of hydrogen sulfide: Synaptic modulation, neuroprotection, and smooth muscle relaxation. Kimura, Hideo; Nagai, Yasuo; Umemura, Ken; Kimura, Yuka. National Institute of Neuroscience, Tokyo, Japan. Antioxidants & Redox Signaling (2005), 7(5 & 6), 795-803. 12. Sulfide detoxification and tolerance in Halicryptus spinulosus (Priapulida): a multiple strategy. Oeschger, Rolf; Vetter, Russell D. Aussenstelle Bremerhaven, Univ. Bremen, Bremerhaven, Germany. Marine Ecology: Progress Series (1992), 86(2), 167-79. 13. Cytotoxic mechanisms of hydrosulfide anion and cyanide anion in primary rat hepatocyte cultures. Toxicology. 2003 Jun 30;188(2-3):149-59. Thompson RW, Valentine HL, Valentine WM Department of Pathology and Center in Molecular Toxicology, Vanderbilt University Medical Center, Rm 109 MCS Annex Bldg., 1401 21st Ave South, Nashville, TN 37232-2561, USA. 14. Chronic toxicity of hydrogen sulfide to Gammarus pseudolimnaeus. Oseid, Donavon M.; Smith, Lloyd L., Jr. Dep. Entomol. Fish. Wildl., Univ. Minnesota, St. Paul, MN, USA. Transactions of the American Fisheries Society (1974), 103(4), 819-22. 15. Toxicity of hydrogen sulfide to hard clam, Meretrix lusoria. Kuo, C. H.; Chow, S. T. Dep. Vet. Med., Natl. Taiwan Univ., Taipei, Taiwan. Zhonghua Minguo Shouyi Xuehui Zazhi (1990), 16(3), 237-43. 16. Toxicity of hydrogen sulfide to goldfish (Carassius auratus) as influenced by temperature, oxygen, and bioassay techniques. Adelman, Ira R.; Smith, Lloyd L., Jr. Dep. Entomol. Fish. Wildl., Univ. Minnesota, St. Paul, MN, USA. Journal of the Fisheries Research Board of Canada (1972), 29(9), 1309-17. 17. Toxicity of hydrogen sulfide and other sulfides. Evans, Charles Lovatt. Chem. Defence Exptl. Estab., Salisbury, UK. Quarterly Journal of Experimental Physiology (1908-1938) (1967), 52(3), 231-48. 18. Tolerance to anoxia and hydrogen sulfide by benthic crustaceans, Portunus trituberculatus, Metapenaeus monoceros, and Macrobrachium nipponense. Kang, Ju Chan; Matsuda, Osamu. Fac. Appl. Biol. Sci., Hiroshima Univ., Higashi-Hiroshima, Japan. Hiroshima Daigaku Seibutsu Seisangakubu Kiyo (1993), 32(2), 71-8. 19. Thiosulfate elimination and permeability in a sulfide-adapted marine invertebrate. Julian, David; Wieting, Susan L.; Seto, Shelley L.; Bogan, Mark R.; Arp, Alissa J. Romberg Tiburon Center for Environmental Studies, San Francisco State University, Tiburon, CA, USA. Physiological and Biochemical Zoology (1999), 72(4), 416-425. Publisher: University of Chicago Press. 20. Sodium nitroprusside potentiates hydrogen-sulfide-induced contractions in body wall muscle from a marine worm. Julian, David; Statile, Jennifer; Roepke, Troy A.; Arp, Alissa J. Department of Zoology, University of Florida, Gainesville, FL, USA. Biological Bulletin (Woods Hole, MA, United States) (2005), 209(1), 6-10. Publisher: Marine Biological Laboratory. 21. The sulfide binding function of annelid hemoglobins: relic of an old biosystem? Bailly, Xavier; Vinogradov, Serge. Equipe Ecophysiologie, Station Biologique de Roscoff, Centre National de la Recherche Scientifique, Universite Pierre et Marie Curie, Roscoff, Fr. Journal of Inorganic Biochemistry (2005), 99(1), 142-150. Publisher: Elsevier B.V.